Previously, Google reserved the right to exceed your daily budget by 20%. Now that number is increasing to a full 100%. Scary, huh? Well, not necessarily… While you’ll likely see fluctuations in your DAILY spend, Google still has to stay under the campaign’s “Monthly Charge Limit” (your daily budget x 30.4 days). If a campaign IS charged more than the monthly budget limit in any calendar month, Google has pledged to credit the over-delivery amount at the end of that month. There actually is a method to the madness. Google’s thought process here is to serve your ads to as many customers as possible by “over-delivering” your ads on high traffic days and less during low traffic. While these high traffic days may cause your account to spend double its daily budget, these costs will be offset by less ad serving on lower traffic days throughout the same month. Google has framed this change as a way to “help you hit your advertising goals,” and we’re anticipating that will actually pan out. 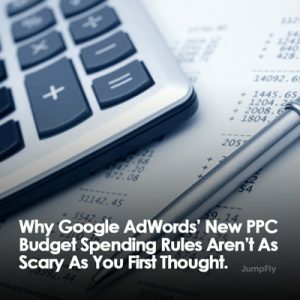 The biggest overall impact to your AdWords spend will likely be that you no longer have unspent budget at the end of any given month. And while this change may feel jarring at first, the over-delivery initiative will likely lead to more traffic and more conversions for you and your business. Now that’s a change we can get behind. As always, reach out to your JumpFly account manager with any questions or concerns!